Yesterday's Apple World Wide Developer's Conference isn't a place where you'd expect a lot of car news (other than fake Stig), but the megacorporation revealed how they'll make the iPhone an even more ubiquitous part of your life with announcement of Siri integration with numerous car manufacturers and turn-by-turn navigation. It's great news for a lot of car companies and bad news for one. Why The Hell Is Apple Using A Fake Stig At WWDC? Obviously absent from the long list of car companies eager to jump into Apple's stainless steel bed is Ford. No manufacturer has made it clearer that they're aligned with Microsoft than the one with the shiny blue oval. Bill Gates Drives a Ford Focus 2-Door? What was once a benefit could now be a liability for Ford. Mat Honan at Gizmodo did a nice roundup of companies smacked down by Apple yesterday, to which I'd add Ford and all the companies who have selected the Windows CE-based Microsoft platform for their infotainment systems. Ford, though, has the biggest problem. Did you even know Kia's UVO system was Microsoft-powered? Probably not. Bill Gates drove a Ford Focus on his last day in office, not a Kia Rio. The risk isn't even particularly technological. What Apple is promising is a button on the steering wheel that lets you use Siri on your iPhone for voice controls through your car's infotainment system. SYNC already does similar tasks (though, like Siri, voice activation isn't perfect). I mean. It's just ONE FREAKING BUTTON! When has Apple ever been able to beat the world with one… oh, wait. Ford has also been better about accepting that the future of in-car telematics may largely be BYOD (Bring Your Own Device) and interfaces with the Apple iPhone easily. There's probably no reason why they couldn't add Siri capability if they wanted to. In fact, it might be smart for them to stay mobile-OS agnostic in the long run. "It's great to see others supporting voice recognition for control of mobile phones inside the car. Five years ago, Ford was first to introduce the ‘brought-in' device connectivity strategy with SYNC and today, we have more than 4-million cars on the road that allow voice control of the devices that our customers love. SYNC will continue to lead the industry by delivering a full-function, voice-enabled connectivity experience available to all customers no matter the phone that they own." No, the biggest risk is perceptual. Will GM and Mercedes cars with a little Apple button drive consumers who care more about technology than driving dynamics into their hands and away from Ford? 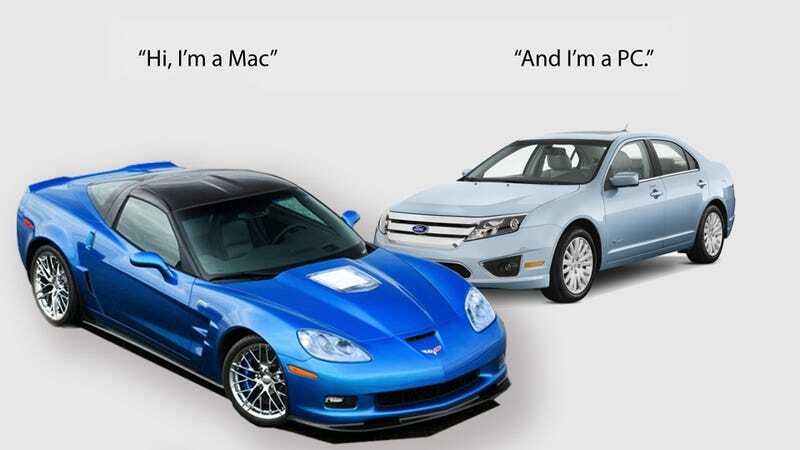 Will A Chevy Cruze be a Mac and a Ford Focus be a PC? Ford has invested so much money and time in being seen as the cool, technologically advanced domestic brand it risks a lot if it doesn't find a way to neutralize this sudden threat.